I am in shock. I have no words. 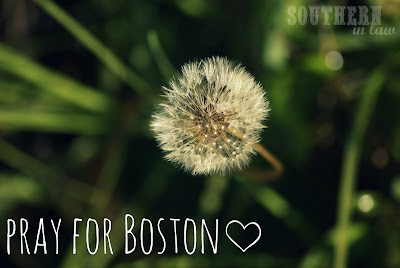 Waking up this morning to the news of what has happened at the Boston Marathon has left me speechless. My prayers and thoughts go out to those affected by this awful tragedy - the runners, the volunteers, the police, the first aid officers, the families, the friends - everyone. Today we should all stop for a moment to pray for these people - for their wellbeing, their fears, their uncertainty, their pain, their injuries, their peace of mind. Today we should all hug our family members a little tighter, always remember to say please and thank you, to smile to people we see, to not complain about trivial things - to be thankful. For those worried about people in Boston, you can use Google Person Finder, find information on those runners who finished and their whereabouts, use the Red Cross's Safe and Well Search. Today we need to be thankful for our safety and our wellbeing - but we need to pray that tragedies like this don't happen again. We need to pray for the sick people that do this, for their minds to be healed so that they can realise just how wrong this is.